Even in the fast-paced world of traders, it’s understood that taking the time to do some research is part of doing the job well. The same is true when it comes to writing or rewriting your resume. 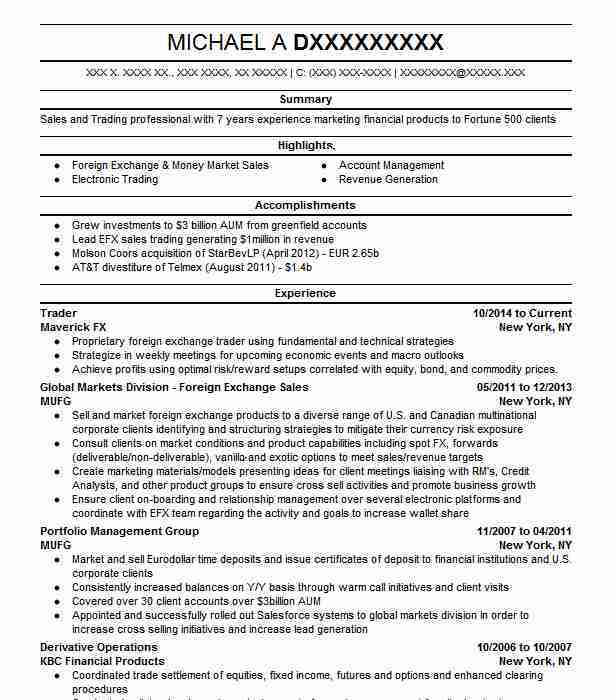 By taking the time to review a few current trader resume samples, you’ll be able to identify the kind of information included in a trader’s resume and the format options used to present it. The guide that follows will present and explain the importance of the most often used resume sections, the order in which they should appear, and examples of unfamiliar concepts. Every trader resume will be different by virtue of the variations in education, experience and overall career path. A financial analyst hoping to move into an equity trader position will present transferable skills while a day trader looking to make a lateral move will likely focus on their career accomplishments. Chronological format: This format focuses on the job seeker’s work history, which indicates a traditional career path. For those with no employment gaps, it would be a good choice. Functional format: Job seekers with difficult to explain employment gaps, periods of self-employment, or who are looking to change careers may find this format friendlier to presenting their work history, since the focus is on accomplishments rather than previous employers. Combination style: This format works for those who prefer using elements from both formats and are comfortable creating their own combination style. 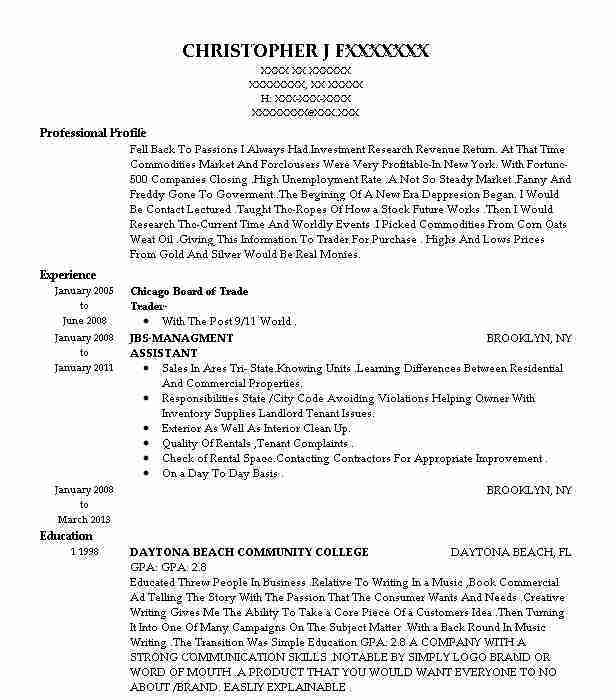 By reviewing trader resume samples you’ll not only determine which format best highlights your skills, but how each looks on the page. Traders live in a world of snap decisions, and so do potential employers. Your resume summary statement, as the first element of your resume the employer reads, could be a make-it or break-it section. If they’re not compelled to read further, they won’t. Let the job description be your guide as you mirror the employer’s job requirements in your resume summary. You want them to feel like they’ve found the ideal candidate to meet their needs. Experienced equity trader who consistently developed trading strategies to make transactions that maximized profits for banking industry clients. Diligently watched the market, identified trends and evaluated financial risks. All transactions were made in compliance with SEC laws and regulations. Followed markets in different time zones. Portfolio has shown a sizable year-end profit each year for the last decade, resulting in consistent six-figure bonuses. Current intern at a top-50 hedge fund conducting research and other supportive activities. Immersed in the environment by working on-site. Developed a mentor relationship with a senior director of the firm. Fulfilled internship responsibilities requiring 10-15 hours per week while working full-time in another position. Developed in-depth understanding as an emerging markets analyst and acquired high-quality name recognition in the industry. If you’re writing a chronological style resume, the work experience section will follow your resume summary, and will focus on your work history. This style works best for those with no employment gaps, and previous jobs should be listed in reverse chronological order including the following information: job title, employer and location, period of employment, and 2-3 accomplishments performed for that employer. If you’ve been in the industry for many years, it’s important to realize that employers usually consider just the last 15-20 years of employment to be relevant. By limiting your work history, you can avoid age discrimination that you would never be aware of. If you’ve decided on the functional format because you have some employment gaps or you’re considering a move to a different industry sector, insert the accomplishments section between your resume summary and work experience sections. Give careful thought to the 6-8 career accomplishments that will appeal to a potential employer. Refer once again to the job description, and as you compile this list, keep in mind you don’t have to link your achievements to a specific employer, nor do you have to list them in date order. This will allow you to show the employer what they want to see in the order of importance based on the job description. These bullet points should emphasize you agility, successes, and gains made for your employer and clients. Once you’ve completed the accomplishments section, you can move on to the work experience section which will now be a very slimmed-down list of previous jobs. Since there’s no need in this format to include dates, you’ll be able to avoid drawing attention to employment gaps. The third option, the combination style, is your choice to incorporate the best of both formats. 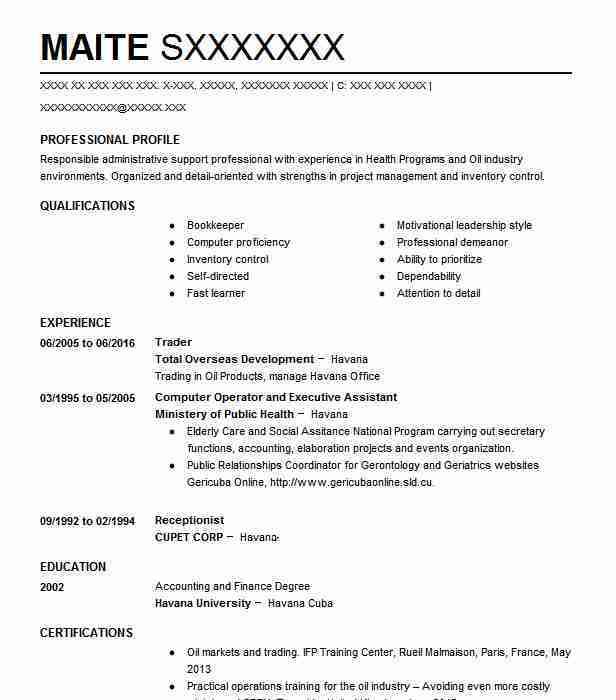 If you like the idea but you’re not sure how to do it, refer to the trader resume samples for inspiration. 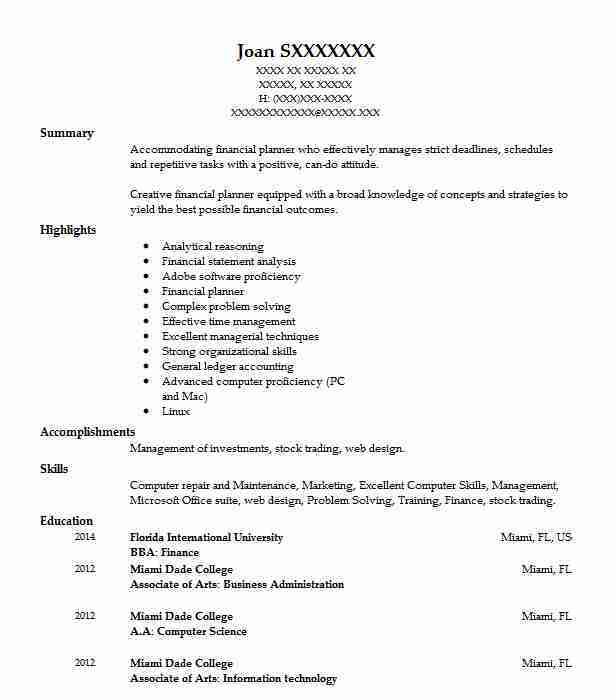 A quick review of trader resume samples can provide additional, applicable action verbs. By referring to the job description, you can determine which skills are most important to the employer and present those that you have in their order of importance. As an example, the skills of a trader can probably fall into three categories: technical, industry knowledge, interpersonal/personal. The two most important resource documents in creating your skills section are the job description and trader resume samples. The education section is your opportunity to break away from the crowd, so be sure to list your highest level of education first, no matter what the qualifications are. While requirements vary, a bachelor’s degree is often the minimum requirements for a trader position. Studies in business, finance, accounting and economics are important to large firms, and often, a master’s degree (MBA) is preferred and is rewarded with better compensation and other perks. Another sub-heading in the education section would be licenses/certifications. There are different licenses which enable the holder to sell various investment products. Some requirements vary by firm, and agents registered with the Financial Industry Regulatory Authority (FINRA) must attend continuing education courses in legal requirements or new financial products to keep their licenses, so be sure to list the courses that fulfill those requirements. There are extensive qualifications in order to earn the Chartered Financial Analyst certification (CFA) from the CFA Institute, but while the demands of this certification are many, it enhances professional standing. 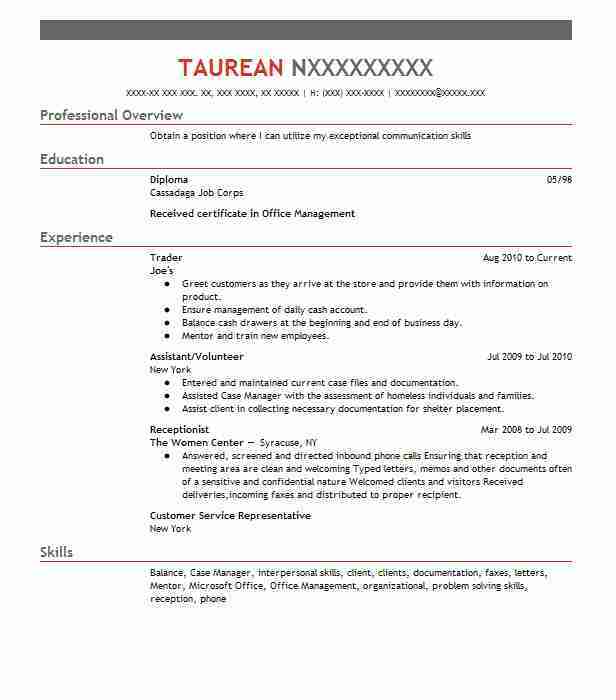 Use the trader resume samples for formatting ideas for the education section. It’s important to keep your resume within the 1-2 page length, and adding your references will make it longer than it needs to be and take up valuable resume space that can be put to better use highlighting your skills and qualifications. Your references should be a separate document that is Ã¢â‚¬Å“available upon request.Ã¢â‚¬ As you’re writing your resume, you’re sure to be reminded of former managers or directors with whom you’ve developed a good relationship that you can use as a reference. If you’re lucky enough to have a mentor, list them too. Obviously, you’ll need permission from each of the 3-4 people chosen. When the employer requests your references, you’ll know for use they’re interested. You can give your references a heads-up to expect a call, and you can ask them to let you know when contact’s been made and how it went. The best way to mirror an employer’s requirements is to use the keywords they’ve used in the job description. They’re the trigger for applicant tracking systems (ATS) to identify resumes that will end up on a human being’s desk. It’s a fact of modern life that to get to the employer, you need to get past the electronic gatekeeper first. Traders are accustomed to snap decisions and fast actions, but when it comes to proofreading your resume, take the time to do it right. Even after you think you’ve got it right, have someone else proof it for you. If there are errors, they’ll jump off the page, and that’s not the look you want to project in your job search. In the regulated business of securities trading, confidentiality is prized, so be careful when you list your accomplishments that you don’t reveal proprietary information. A potential employer will wonder if you’ll do the same to them, and your resume may end up on the reject pile. You may be very familiar with charts and embedded tables, but those formatting tricks often confuse an ATS, and what the system can’t read it won’t pass on. Keep it simple. The Bureau of Labor Statistics has projected the employment growth for the average of all occupations during the period 2014 to 2024 to be 7 percent. are expected to be employed at a growth rate of 10 percent for the same time period. Because the economic growth of other countries contributes to the United States standing as an international financial center, employment in the sector will continue to grow. Issues that may negatively impact employment in the industry include consolidation, automated trading systems and restrictions on proprietary trading. Nonetheless, competition for these high paying jobs will be intense. Successful Trader with eight years of experience making sound investment decisions. Analytical thinker and skilled problem solver. Communicates effectively with clients and colleagues alike. Create and execute short and long-term customized comprehensive financial strategies to reach company goals. Prepare internal quarterly and annual portfolio monitoring reports. Diligently review specialty loans for compliance with all reporting requirements. Analyze financial information obtained from clients to determine strategies for meeting their financial objectives. Interpret data on price yield stability future investment-risk trends economic influences and other factors affecting investment programs. Acquired 14 new clients in the last year for a total investment portfolio value of $750000. Selected and maintained superior investment portfolios. Communicated regularly with management regarding portfolio performance and new loan transaction quality. Created charts and graphs to illustrate daily monthly and annual financial reports. Reviewed clients’ accounts and results regularly to determine whether life changes economic developments or financial performance indicated a need for plan revision. There are plenty of opportunities to land a Trader job position, but it won’t just be handed to you. Crafting a Trader resume that catches the attention of hiring managers is paramount to getting the job, and LiveCareer is here to help you stand out from the competition.